Cavazos drew Eidetic as a way of coming to terms with traditional typography (certain aspects of it, anyway) that he’d learned to hate as a production artist, burnishing tool in hand, in the 1980s. He’d initially intended to meet classicism halfway, but the exploration proved to be too compelling and he quickly crossed that line, and then many others. The design itself was born in 1996 under what the designer considers ideal circumstances: scratched out on grid paper with an old mechanical pencil, while in the passenger seat of a parked car (somewhere near 20th and Valencia, in this case). The original sketch was considerably more eccentric—a sign of its times—with a mixed serif treatment, and quirky bits throughout. Much of this evaporated during the development that followed, and ultimately a sans serif variant was spun off which allowed Cavazos to focus more intently on functionality and cohesiveness. Cavazos self-published the design as Eidetic Serif in February 1998. 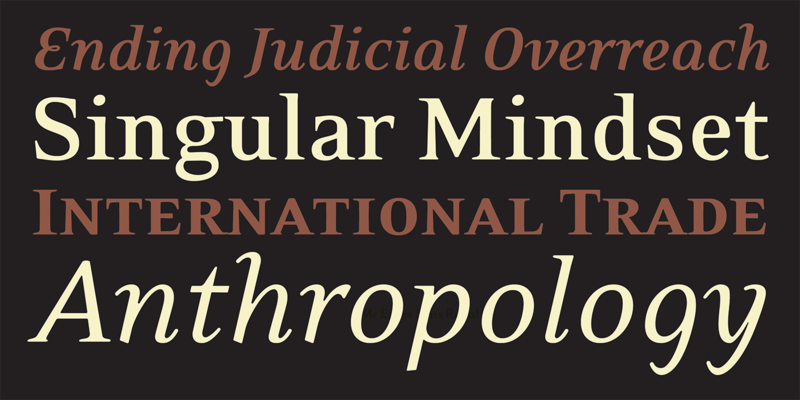 Then, in the spring/summer of 2000, in collaboration with Zuzana Licko, he rebuilt the five base fonts, and added the Black, Omni, and Fractions. 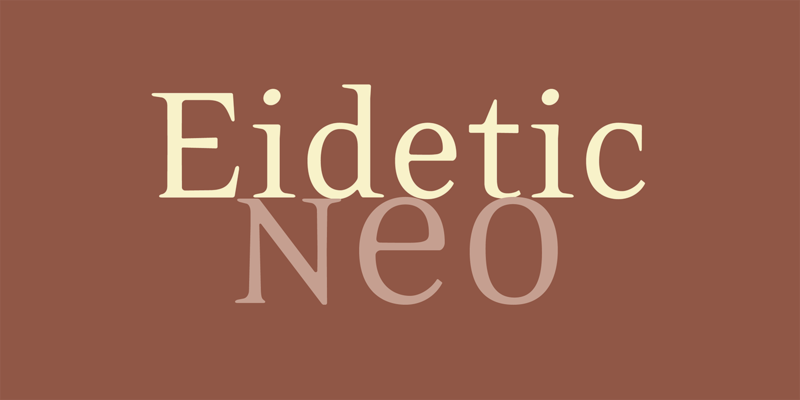 Though visually similar to the previous edition, Eidetic Neo represents a magnitude of improvement, from point structure through to hinting. Eidetic, the adjective, refers to a mental image of overwhelming vividness or clarity. As such, it can safely be said that the name does not apply to the experience of developing Eidetic. That process, according to Cavazos, was more of an iterative blur. Certainly, there are memorable milestones and revelations along the way, but the name is mostly dedicated to certain signature letterforms that link the original vision of the design to this final incarnation. 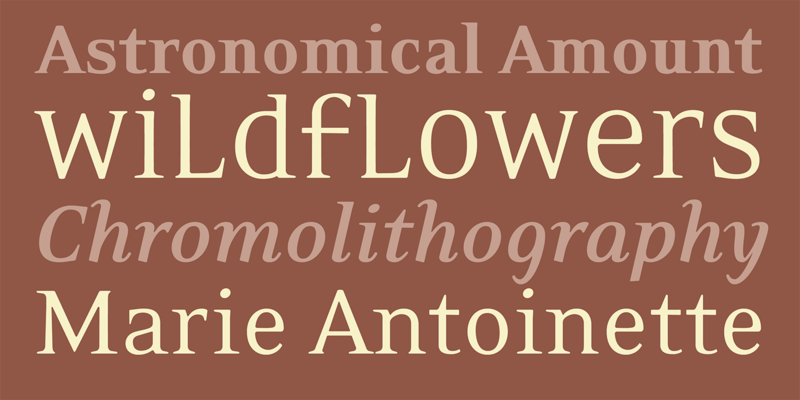 All typography is an arrangement of elements in two dimensions. The right placing of words and lines is as important as the creation of significant and effective contrasts, and is an integral part of it. As type today stands by itself, without the addition of ornament, we have become more sensitive to it not only as words and lines, but as part of the design of a page. The sizes and weights of type used depend first and foremost on the contents, but almost always we have scope to choose a larger or smaller size or to alter the graphic appearance of some of the lines. A line need not be full out to the left but may be moved a little or a lot to the right. Here begins true design, the shaping of the graphic form. Every shape exists only in relation to the space around it. The same line has a totally different effect in a large or small area of white space. In either case the line can be so placed to achieve the best effect; but the placing and its overall effect will probably be quite different in each case. It follows that there is a “right” position for every shape on every occasion. If we succeed in finding that position we have done our job. Jan Tschichold, Basle 1935.